This Arts and Crafts style desk borrows its esthetic scheme from designers of the 1920's. 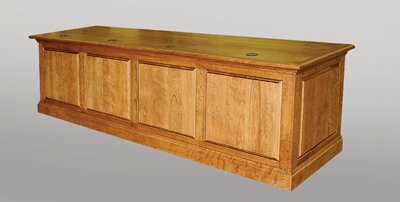 Featured in Quarter Sawn White Oak and Walnut, this design is as practical as it is attractive. The accessory drawer allocates storage and fits flawlessly into this sleek layout. The top includes custom Walnut inlays to match the Walnut trim detail. Available in any wood or finish. Customize with your AV requirements. Reference MFI #99100.